Today during sacrament meeting, I watched as Aaron and the other Priests reverently prepared the sacrament. 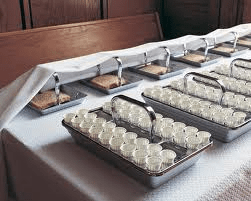 After serving the bread, and receiving the empty trays, they covered them carefully with the white cloth, and then lifted the cloth off of the trays of filled water cups, before kneeling to bless that water. But first I watched Aaron gently tuck the cloth so that the full tray on the end was completely exposed–it had been partially covered. I thought about that today as I partook of the sacred emblems. We uncover the bread, then uncover the water before the sacramental prayers are offered. What about my heart? Do I uncover my heart? Do I remove the lids when I pray? Do I open the pot? Do I prepare myself to receive the blessings I ask for?